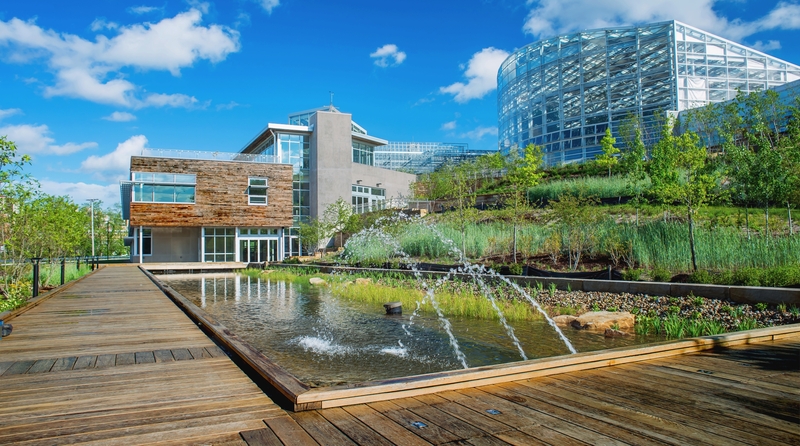 Phipps Center for Sustainable Landscapes, in Pittsburgh, Pennsylvania, used green infrastructure as one of its strategies to achieve SITES and LEED certifications. SITES provides guidelines and verification for innovative practices in tailoring green infrastructure to achieve conservation, restoration and public health goals. As of October 2016, certain LEED and SITES credits can be applied reciprocally. SITES has a strong conservation focus and establishes guidelines for protecting sensitive land and habitats. It offers incentives for projects that restore landscapes to replicate natural site conditions, such as through reestablishing natural hydrology, soil makeup and vegetation. Green infrastructure can also help contribute to credits that measure human health and well-being. Green roofs, green walls and bioswales turn underutilized areas into spaces that support recreation and relaxation, civic engagement and urban food production. Parksmart addresses an often overlooked facet of the built environment: parking infrastructure. Parking structures often include large, dark, impervious surfaces, which make them a significant source of polluted runoff and a local heat island. Parksmart recognizes projects that use green infrastructure, including green roofs, green walls and permeable pavers, to mediate these ecological challenges and to transform parking structures into community assets. Additionally, by encouraging carpooling, car sharing, bicycling, and alternative fuel vehicles, Parksmart helps expand more sustainable transportation choices. To ensure these leading practices, strategies and tools are being used in planning and development, cities can require development projects to follow an integrated process. This highly collaborative practice, which is integral to SITES, LEED and Parksmart, enables project teams to identify opportunities for using green infrastructure to meet project goals throughout the design process. Considering green infrastructure early and often allows project teams to optimize its use for maximum benefit – such as retaining and infiltrating water and keeping cities cool. Green infrastructure initiatives help us build a brighter—and greener—future.